Please mention dramagroups.com when replying to events. 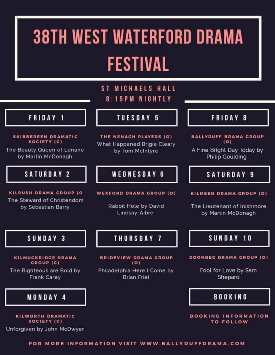 Drama season is just around the corner and we are very excited to announce our line up for the 38th West Waterford Drama Festival. A wonderful mix of new and old, with something to wet the appetite of all our patrons. As well as that we have some wonderful fringe events in the pipeline. Stayed tuned for updates. We thoroughly look forward to opening our doors to our wonderful audience on the 1st March. Tables of 8, £12.50 per person. 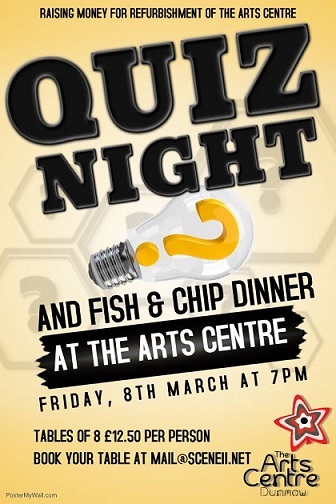 The Arts Centre is now in its 13th year so we are raising money to refurb the Centre and this is our first of many fundraising events throughout the year. The dates for our next course are: All fall on a Saturday. The VENUE: The Central Hotel, Exchequer Street, Dublin 2. Our next Get into Film & TV Acting course which runs for 10 weeks every Saturday. We have a new course starting on March 9th and have a few places left. If you are interested and wish to avail of a place please let us know. All the information is below and any questions please don't hesitate to contact us. The course is run by Gillian Reynolds Casting and we have a guest Film Director too to give workshops. The course covers the key areas in the world of Acting: It is primarily aimed at Film and TV Acting for Newcomers. •	The difference between one camera and three camera's for Film-Episodic T.V. and Soaps. •	Audition and Interview technique. •	Make a short Film in a day with the knowledge learnt from the course. •	How to market yourself within the Industry. Ever thought you could have a Professional showreel Headshot and C.V. by the end of a 10 week course? It runs Every Saturdays from 10am-5.30pm.Punctuality and commitment are essential. The cost is E65 per week.It runs for 10 weeks and the total cost is E650. This can be paid in instalments and should be paid in full before the course starts. 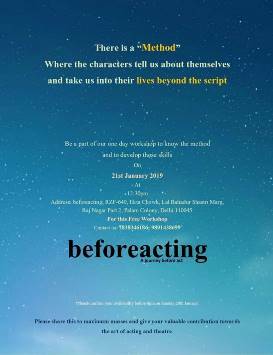 It is aimed at those wishing to enter the world of Acting-perhaps they have been an extra- or for those who have been out of the Industry for a long period of time. The objective is to get you up and running within the Industry upon completion of the course. To this end the last day will accumulate in you performing a monologue or duologue which will be filmed and edited professionally for you to launch yourself within the Industry! The adjudicator will be Alan Haslett ADA GODA. 5 students from Bath Spa university for our final year are organising an event located in Circo on the 14th March 7:00pm. 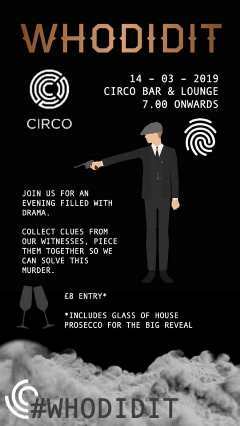 Join us for an evening of intrigue and mystery as we find out who did it.The evening is a 20's themed murder mystery with opportunity for you and your friends to come and play real life Cluedo. You and your friends will have the opportunity to interview the suspects and immerse yourself in the atmosphere as you decipher who did it. Expect to be surprised as you enjoy a glass of bubbly, on us, at the grand reveal at the end of evening. Friday 22 (C) Eclipsed Tinahealy D.G. Saturday 23 (O) The Lieutenant of Inishmore Kilmeen D.G. 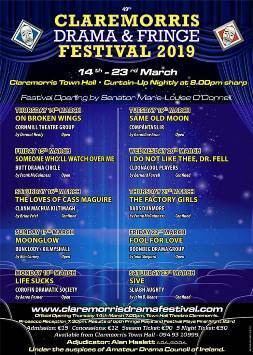 Sunday 24 (O) What Happened Bridgie Cleary Nenagh D.G. Monday 25 (O) ‘The Steward of Christendom’ Kilrush D.G. Tuesday 26 (O) Philadelphia Here I Come Brideview D.G. By Bryan McMahon Tarbert D.G. Thursday 28 (C) Unforgiven Kilworth D.S. 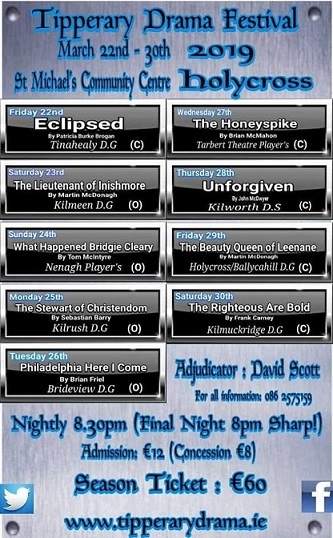 Saturday 30 (C) The Righteous are Bold Kilmuckridge D.G. Pre-booking necessary as numbers are limited. Experienced MD and musical theatre buff Chris will take us through a range of musical theatre chorus numbers over the course of three workshops, some familiar and some less well known but just as catchy! 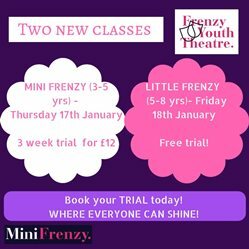 As well as learning the songs, we will focus on developing good vocal and chorus techniques to get those show-tunes sounding like they came straight out of the West End! To book a place: Email sian.walters@brostc.org stating which sessions you would like to attend and whether you are a member or non-member. Sessions are free to members. Non-members please bring £5 cash to the sessions you are attending. 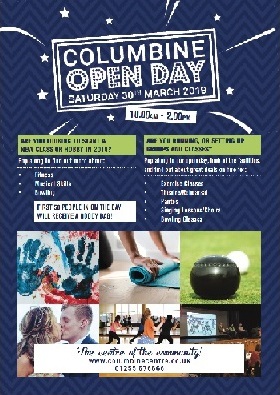 I would like to invite you to The Columbine Centre Open day. The centre has amazing facilities for drama groups, we would love to show you around. Being an adjudicator can be an incredibly rewarding job, but it can also be a challenging one. 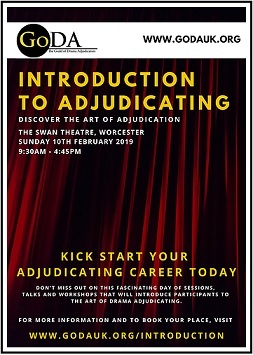 Join experienced GoDA practitioners for a day of informative and practical talks and workshops that provide an introduction to the life and work of an adjudicator. Introduction to Adjudicating is broken down into sessions led by experienced GoDA members who will guide you through the inner workings of adjudicating drama. The day is not a formal part of the entry process and is your chance to ask as many questions as you would like as well as trying your hand at adjudicating in a safe and comfortable environment. Should you wish to go forward for the selection weekend you will not be assessed by any of the adjudicators who have led sessions during this introductory day. NB. Although there is no requirement for you to have completed the day in order to progress to the selection weekend, we have found that the day proves very successful for candidates who decide to apply for Associate Membership of the Guild. 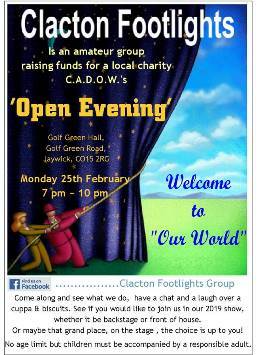 The event is open to all amateur drama groups. Tickets for this show are priced at £5.00. There's only a few days left until our Improvised Musical workshop and we still have a few spaces left to fill! If you’re lucky enough to have seen Showstopper! The Improvised Musical and wonder how anyone could come up with it without months of rehearsals, a script and a score, then why not join us and be taught by one of the Showstopper! cast themselves? 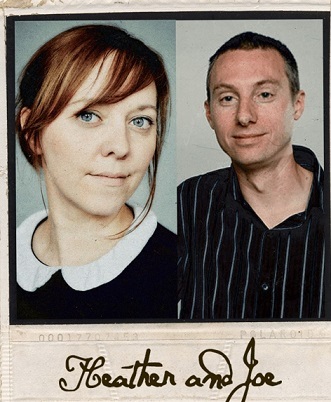 Heather Urquhart and her musical improviser partner, pianist Joe Samuel, are coming to give BROSsers an insight into the wonderful world of making up songs. During the day we’ll be doing some musical improv exercises and games to encourage spontaneity and creativity, plus a whole lot of singing! You don’t have to have done improv before and you don’t have to be funny. 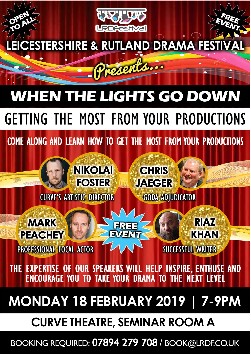 Improv is a great skill to have in your theatre toolkit, and you’ll take away lots of useful tips from the day, plus of course, it’s going to be loads of fun. And if the very thought of making things up scares the life out of you, well, you’ll be in a safe, supportive environment where there’s no wrong answer. After all, how can you get the lyrics or tune wrong to a song that you are writing? "Feels amazing having these skills in my toolbox." "You'll hurt yourself laughing. With teachers like Heather and Joe you believe you can do anything." Welcome to our world.RCome along and see what we do, have a chat and a laugh over a cuppa & biscuits. See if you would like to join us in our 2019 show whether it be backstage or front of house. Or maybe that grand place, on the stage, the choice is up to you! No age limit but children must be accompanied by a responsile adult. 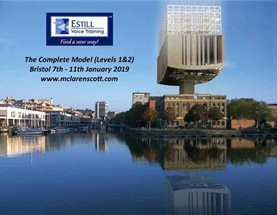 At the end of the working day, why not exercise your creativity and spontaneity on this course especially designed for professionals wanting to gain confidence, to think on their feet and to be liberated from the daily grind! Come and join our improvisation course in the heart of the City. Classes are at the renowned Guildhall School of Music & Drama (a short walk from Moorgate) on Monday evenings for six weeks beginning on February 25th. Bring friends or come and make new ones! This engaging evening course is ideal for anyone who wants to improve their presence in a room, confidence, and presentation skills; whether you have a specific goal such as a presentation at work or a public speech, or if you want to improve your everyday communication skills. Participants will learn what it takes to both capture an audience and connect to an individual through a range of technical and emotional work. Contact: If you have any questions, please drop us a message via Facebook. 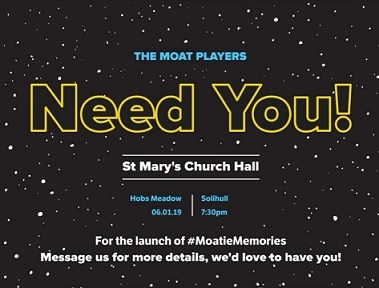 Calling out to past members of The Moat Players, current members and anyone who is interested in joining one of Solihull's longest running amateur drama groups. 2019 sees the group celebrate their 60th anniversary, and we are staging a show in June 2019 to celebrate this momentous occasion. Come along at 7.30 pm on Sunday 6th January to hear about what we have got planned, and join in the fun. Whether you would like to be onstage, backstage or front of house, you are very welcome. 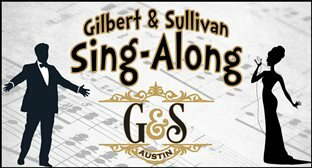 Your chance to sing along and celebrate the new year with classic choruses. This course is for anyone who would like to improve their singing or speaking voice—singers, actors, vocal coaches, drama instructors, speech-language pathologists, and other vocal health professionals. Level One: Figures for Voice™ teaches the Craft of speaking and singing. During this course students are introduced to 13 vocal structures that influence voice quality. Each structure produces a range of different vocal sound effects. The Figures for Voice are exercises used to develop predictable control of each structure’s options. The skills developed in Level One will help you add strength, clarity and stamina to your voice! Level Two builds on the knowledge and skills from Level One by asking students to combine different options learned through the Figures in "recipes" for six basic voice qualities. These qualities – Speech, Falsetto, Sob, Twang, Opera, and Belting – appear as specifically defined by the Estill Voice Model. Figure Combinations for Six Voice Qualities™ gives you a better understanding of the human voice’s limitless possibilities, along with how to keep it vibrant and healthy. Throughout the day, new voice skills are practiced in small group sessions. Participants will be given the chance to explore Figure applications for individual repertoire and case studies in open coaching sessions. There will also be ample time for questions and discussion. This course will be presented by Gillian McLaren Scott, Estill Master Trainer and Scotland's only Estill Mentor & Course Instructor. "How to active your subconscious"
Let it drive your acting journey. Let it drive maximum proportion of your life. Let it help you to generate real human behaviour, emotions and attachments while performing. 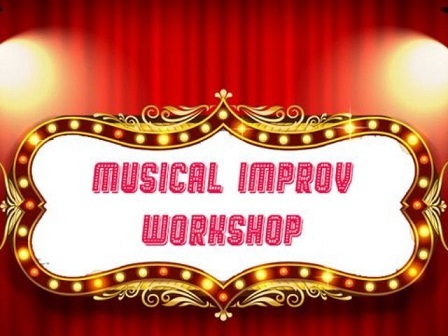 This improvisation workshop will focus on the teaching and delivering of techniques to stimulate creativity and inspire exploration of the process. Being a teacher in creative arts can exhaust your own creativity and this workshop is designed to give you fresh and exciting ideas at the point of delivery. All creative art starts with an idea. We all have ideas ergo we all are creative beings. Some of us are lucky in that we have the time, space and capacity to expand an idea into a whole thing, whether that’s a picture, an object, a piece of music, a dance or a story. For some, the process is more challenging. With the increased demands of the new specifications it is even more important that students have the tools to devise/improvise quickly and effectively. To play make believe, or role play as the dramaturgs call it, is to explore and experience. It gives students confidence and tools for communication and installs in them a sense of familiarity, preparing them to be an adult in a complicated world. It enables them to become proud creators of work, a feeling that will linger with them as they grow and mature, bolstering their future confidence in the world of employment. Improvising and devising has a far reaching effect on a student’s development. Teaching young people to improvise is a challenge. It takes planning, creativity and in depth knowledge of the process. You must be a facilitator. A guide. You must try to remember how it feels to have your mind go blank or be out of control, to not have words to explain your feelings or to be able to express your wishes clearly. Because teaching improvisation is about understanding vulnerability and allowing that nakedness, that openness or emptiness to be the start of something. 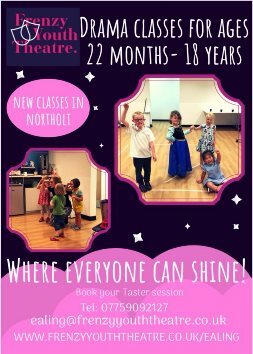 Classes are £5 a class, £25 and 15% off for the first half term. Love your TV, fims, music and drama? 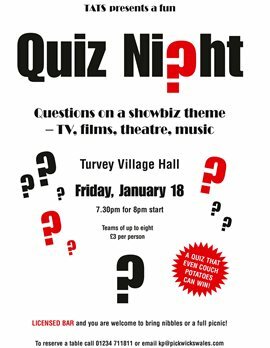 TATS legendary showbiz quiz will take place on Friday 18th January 2019 – 7.30pm for 8pm start. All are welcome to this great evening out, with questions on a showbiz theme – TV, theatre, films and music. Licensed bar – bring nibbles or a full picnic! 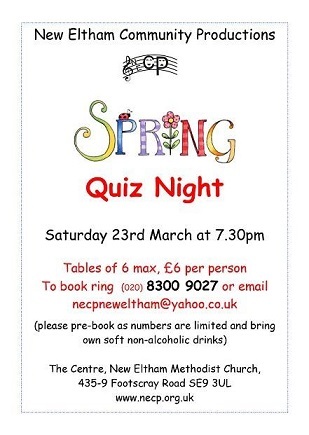 Teams of up to 8 – £3 per person. 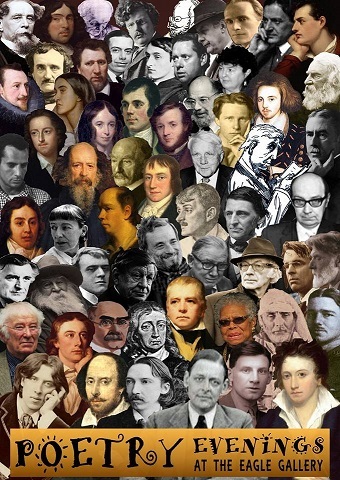 There is a 'Method' where the characters tell us about them,selves and take us into their lives beyond the script. Be part of our one day workshop to know the method amnd to develop those skills. 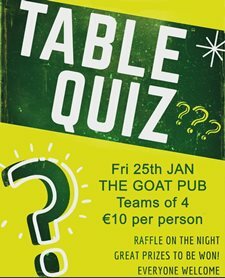 The questions will be fierce, there'll be raffle prizes galore and the craic will be mighty!! So come down, bring a friend and have a laugh!! 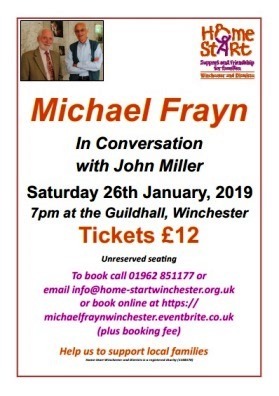 Literary great Michael Frayn will be in the hot seat in Winchester in January 2019, answering questions from John Miller on the playwright and author's remarkable career. Best known as the author of the farce Noises Off and the dramas Copenhagen and Democracy. His novels, such as Towards the end of the Morning, Headlong and Spies have also been critical and commercial successes and his plays have won six Evening Standard and three Olivier Awards and Copenhagen also won the Prix Moliere in Paris and a Tony Award for Best Play on Broadway. Michael Frayn is unusual in being equally successful as novelist and playwright, a distinction he shares with Anton Chekhov, which may explain his third writing gift of translating the latter’s plays from the Russian. His novel Skios was nominated on the long list for the Booker Prize, and his previous book Stage Directions is a collection of his essays about his theatre work over half a lifetime, including the introduction to his last play Afterlife at the National Theatre. It is also a reflection on his path into theatre: his early, ill-fated attempts at Cambridge Footlights, his subsequent scorn in his newspaper columns and, surprisingly late in life, his reluctant conversion to the stage. “Since I have spent my life writing novels as well as plays, one of the questions which people always ask is how I decide whether a new idea is one for a play or for a novel. The answer is that I don’t. The matter decides itself. The idea that takes shape inside one’s head has its form written upon it; that’s what makes it an idea and not just a piece of wishful thinking,” says Michael. The event at Winchester Guildhall at 7pm on Saturday 26th January, will be followed by a book signing by Winchester booksellers P & G Wells and tickets at £12 are available by calling 01962 851177 or email info@home-startwinchester.org.uk or online at michaelfraynwinchester.eventbrite.co.uk (plus a booking fee). Come to our Open Evening at Pegasus Theatre! Come to the Open Evening for our Acting Diploma, developed in association with the Bristol Old Vic Theatre School - part of the Conservatoire for Dance and Drama, and one of the leading drama schools in the world. We have created a unique course that draws on the richness and rigour of the drama training at the Old Vic Theatre School but makes it available for 16-18 year olds. As well as acting you’ll learn about careers in production and technical theatre and if that’s a route you want to explore we can broker learning and work experience with our partners. We’ll support your progression to a technical theatre course or into work and having an understanding of the acting process will stand you in good stead. You’ll receive 24 hours a week of contact time over 38 weeks a year for 2 years. The weekly timetable is structured over 4 days leaving a day for independent study and assignments. You'll need to be on track to get at least five GCSEs grades A*- C or a BTEC Level 2 Diploma (at merit or distinction). In exceptional cases we can take students who don’t have GCSE English or Maths at grade C or above and we can provide tuition in those qualifications alongside the course. Though experience of dance, drama or expressive arts subjects are advantageous in giving you a sense of what’s involved, we are more interested in raw talent and welcome your application even if you have had little or no experience. The course will help you discover the actor you are, your unique voice and how you discover the truth to discover the actor that you are. The core of the programme is the acting class that runs throughout the course. There you will learn about searching for and communicating truth, find inspiration from exploring acting techniques from Augusto Boal to Meisner, and develop ownership of your work as a theatre maker. The voice programme focuses on learning how the voice works, voice production techniques, speech and accent work and interpreting text. The movement programme works to free the body from constraints and personal habits and develop a more conscious control of the body as the actor’s instrument. You’ll explore a variety of different approaches to character physicality including Laban, Animal Studies and Rasa Box. Introducing Our Stage and Screen Production Extended Diploma Course! Our new Stage and Screen Production Arts Diploma developed in partnership with the Bristol Old Vic Theatre School - part of the Conservatoire for Dance and Drama, and one of the leading drama schools in the world, brings a strong new offer for young people in Bristol. There are so many opportunities for well-trained people ‘backstage’ in the arts and entertainment industry and yet so few people are aware of these hidden careers. The course is a full time two year Extended Level 3 Diploma (that’s the equivalent of up to 3 A* A-levels) at the end of which you can choose to progress to university, a drama school technical theatre such as The Bristol Old Vic Theatre School course or you'll be able to go straight into a higher apprenticeship or employment. Have you ever thought how great it would be to control the sound desk at Glastonbury, be part of the backstage team on the latest hit musical, or be a camera operator the latest Bond movie? Well those jobs are achievable and your first step should be the new boomsatsuma stage and screen production arts course. If this sounds like something you would be interested in then get in touch by DM on Facebook and Instagram, or email us at hello@boomsatsuma.com. We would love to hear from you! Available for parties and private events and fundraisers.